This entry was posted in People, PNG and tagged Aiyura, Aiyura National High, Divine Word University, Gordon Secondary, Goroka Secondary, HSC exams, Kerevat, Kerevat National High, Kitip Secondary, Kopen Secondary, Marianville Girls Secondary, Mt Hagen Secondary, Passam, PNG Education System, Port Moresby National High School, Sogeri, Sogeri National High, UniTech, UNRE, UPNG, Wawin National High School, year 12 acceptance. Bookmark the permalink. It’s interesting to note this report and am would request should analists follow up these group of students to their first or second year of studies at respective uni campuses. The follow up is to confirm whether students passed from schools that have recorded high number on your list will continue or fail between 1st & 2nd year of their studies. My concern is for Quality candidates for PNG & NOT Quantity from each schools listed. Perhaps we can draw conclusions whether teachers in each schools do teach their students or it is another bias tactics to pass their students. Its good to publish such information. These schools are well equipped with resources than others. What about schools like Passam National High School which has just started with no proper resources. A quality student is needed in the country, not quantity. Poor quality students fill up universities and later most dropped out at 2nd or 3rd year while quality students who should have been selected are missed out because of judging the status of a school. It would be good to ask why particular secondary schools are able to send many students to universities annually compared to others. 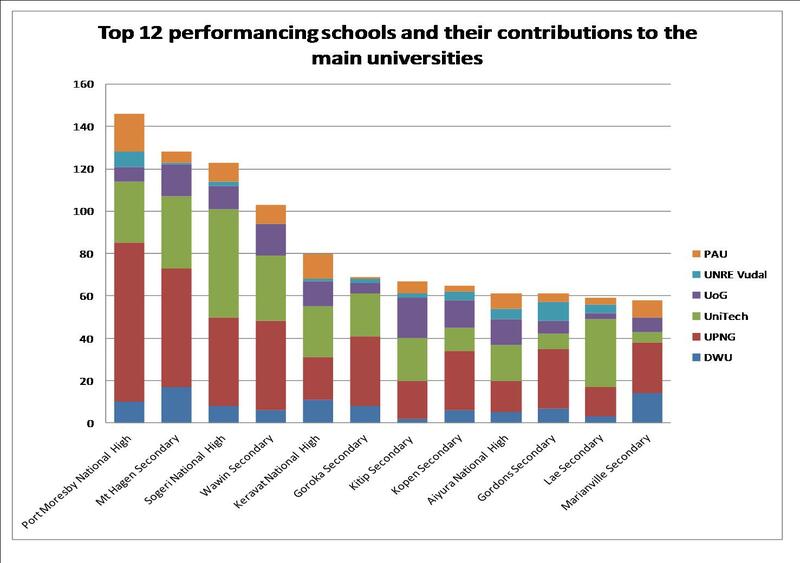 I don’t think there is anything sinister about those top performing schools. I believe every grade 12 student site for the same grade 12 exams. 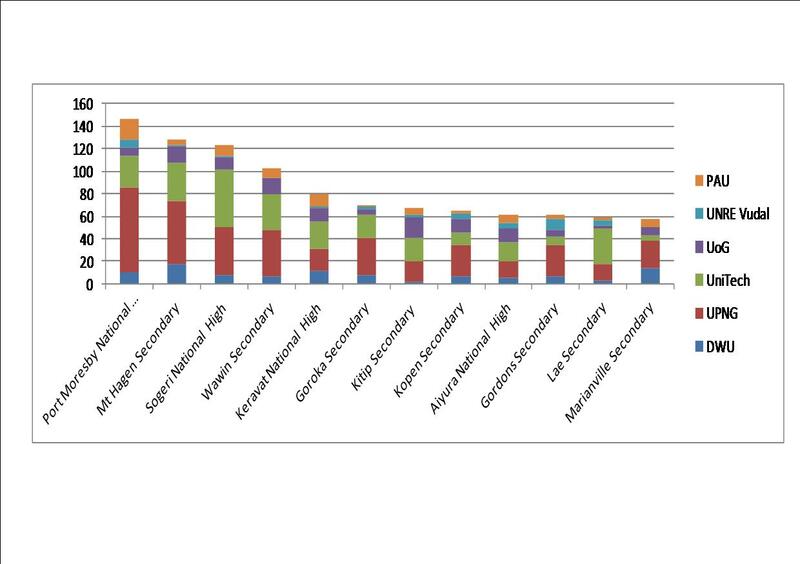 Obviously the top performing secondary schools are those that enforce high standard of discipline, school environment and facilities may be conducive for both students and teachers and that some of the schools are national high schools that only take top performing grade 10 students from other secondary schools whilst most secondary schools take their grade 10 students right through to grade 11 and 12 with possibly average grades. Additionally some secondary schools may be located outside main towns and cities and may not have access to electricity, internet connections, computers and other problems associated with it. This may also prove crucial in the student education and the subsequent grade 12 results. I have lived abroad and can honestly say that PNG has some of the best brains in the world and can perform competitively if only sufficient funding is put into building the capacity of secondary schools apart from technical schools, collages and Universities in PNG. I believe in quality education not quantity. I understand the PNG University of Technology has set some standard whereby a student wishing to enroll at PNG UT is required to bring in the original grade 10 and grade 12 certificates including passing an aptitude test. I think that system is set to further filter dubious applicants. This should be practiced right through out other collages, technical schools and universities in PNG. If a honest hard working student is able to secure a university placements than the success of the student failing or passing his or her university studies will depend on the student setting priority, being self-discipline, being commitment, being able to set their goals and being master of their own destiny. I am the one to boot mt Hagen secondary to next leader. 2015 science 2nd dux student. i did so you can.